No, your eyes do not deceive you! That really was my big fat check from Ebates last quarter. Wanna hear a good story? I shopped at one of my favorite stores online during Cyber Monday, this store was having a 75% off promotion (score!) AND Ebates was doubling all the cash back % during this period from 15% to 30% (double double score!). I literally screamed with joy when I got my cash back confirmation email because...wait for it...the 30% cash back was calculated on the order amount prior to applying the 75% off coupon. O. M. G. I ended up getting paid 5% of the order total. I made money! (And got a lot of free cute stuff!) This was a very rare occurrence (unfortunately that store is no longer on Ebates), but it does go to show you that you should never forget to check Ebates first before clicking that darling little 'complete purchase' button. Good things happen when you use Ebates! 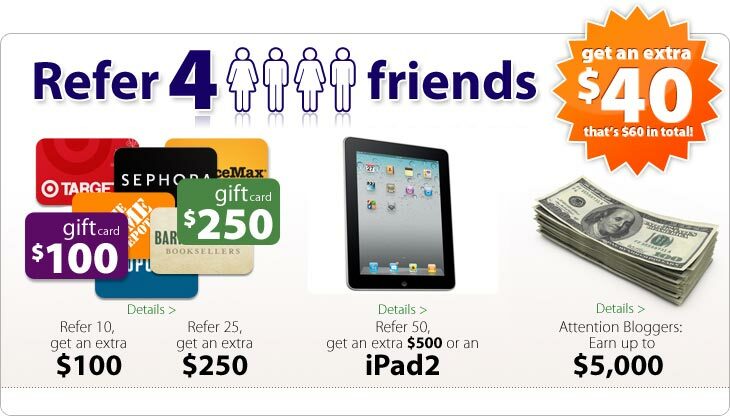 Until 3/31/12, Ebates is giving bonus money for referrals in addition to the normal $5/referral: $40 extra for 4 referrals, $100 extra for 10 referrals, etc (more bonuses here) who purchase using the store links through Ebates. I've gotten 2 referrals this month and would love to get 2 more. If you would like to help me out, please sign up for Ebates here, if not, that's ok! You can still sign up just by going to the normal Ebates website. I also want to share another cash back shopping tip with you: I recently learned that Ebates has a toolbar for Firefox (get it here), which is great for someone like me who has often kicked herself for not going through Ebates first. But that's not my shopping tip! I have also recently learned that Extrabux, another cash back site much like Ebates, has a Firefox add-on (get it here) that notifies you when you're on a shopping site that can give you Extrabux cashback. Guess what? If you have the Ebates toolbar AND the Extrabux add-on installed, you can use both sites to maximize your cash back! I just used both at the same time the other day to purchase some gorgeous wedges from DSW! So sign up for Extrabux here using my referral link (or just go to the Extrabux website to sign up). Ebates and Extrabux both give you a $5 sign on bonus. It's amazing! So if you're strapped for cash, but you're also a shopping fiend (like me), maximize your cash back using both Ebates and Extrabux! Do you have any cash back shopping tips? Please share! I'd love to hear it!